Over the years we’ve become even more focused on dedicating the day to those we love, going above and beyond the traditional flowers and cards. 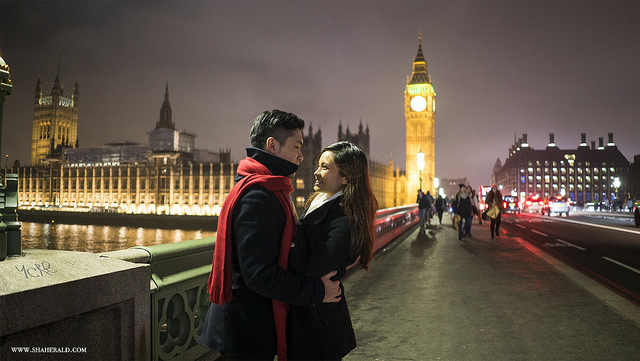 And so being in one of the most vast and varied cities in the world, where there’s something for everyone, we’ve compiled our list of eight of the most romantic things you can do in London (whether you decide to visit us on Valentine’s Day or simply want some romantic inspiration at any point throughout the year!). One of our most popular requests at DUKES, there are fewer more romantic ways to spend an afternoon than a stroll to nearby Green Park, unspoilt by little and dominated by natural beauty, with a prepared picnic hamper ready for you to enjoy under the London sky. But to add a little something extra, our picnic in the park is inclusive of your own butler service. A butler will meet you at the park, lay your rug, set up your food and serve your drinks before leaving you to enjoy your time alone. You might need a few extra layers to enjoy it on Valentine’s Day, but in the warmer months it can be one of the most relaxing – and romantic – ways to spend an afternoon. Whilst it’s ‘only’ been a fixture of the London skyline for 18 years, the London Eye has become synonymous with the city. Allowing you to see unparalleled views of all of London from the comfort of an enclosed pod, the experience of being on the London Eye itself is fantastic – but it can be made all that more special for those looking for something a little more romantic. Taking advantage of the ‘Cupid’s Capsule’, you can enjoy a 30 minute rotation of the Eye whilst sipping a bottle of champagne and nibbling on luxury chocolates. Time it for when the sun is setting and you have an ideal way to finish a day (or start an evening!). If the London Eye offers a brilliant experience of London from above, why not step out of your Cupid’s Capsule and straight onto a river cruise along the Thames to enjoy a bite to eat? Available for lunch, dinner and afternoon tea, you can sail along the Thames, taking in some of the most notable sights that the city has to offer, at a truly leisurely pace, whilst continuing your loving indulgence with food and drink. One of the more untraditional romantic options when in London, there’s no arguing, however, that if you’re a fan of life across the Atlantic, a visit to somewhere such as The Love Shake or The Diner can be a brilliant way to while away the time. With the former a particularly accurate USA dinner in Shoreditch (inclusive of free coffee) and the latter having an extensive menu that could have been taken straight out of any Hollywood movie from the 1950s, you can cuddle up in a booth and chat away whilst eating, drinking and thinking you’re in that movie yourselves. Sometimes, after busy weeks working, family commitments and everything else life throws at you, your idea of a ‘romantic break’ is one where you can fall into your hotel room and not have to reemerge for at least 24 hours. And that’s exactly what we’ve perfected at DUKES. Looking at our romantic escapes, you could take up residence in our Duke of Clarence Penthouse Suite, which has its own private balcony, and enjoy 24 red roses, chilled champagne and luxury Fortnum & Mason chocolates on arrival. Including a massage for two (available in the suite itself), and breakfast in the room the following day, you only need to leave to enjoy the five course meal in our Great British Restaurant (GBR) and a wonderful romantic horse and carriage ride around Hyde Park – bliss! Sometimes, the stars align perfectly and everything falls into place. Whether that’s work or relationships, it can be a truly breathtaking experience to see the London sky lit up and dominated by the glorious stars. With it possible to enjoy a spot of stargazing easily (Morden Hall Park is a renowned location for it), the Royal Observatory in Greenwich is perfect for a bit of advice and guidance – and use of their Victorian telescope – to help all starry-eyed romantics enjoy the wonders of our universe. Whether it’s the smarter attire, formal pleasantries or the music of the time, it’s hard to argue the 1920s doesn’t have a romantic appeal to it. And whilst London can’t whisk you back in time directly, it can do a very good impression with some beautifully themed bars and restaurants. Giving you the opportunity to get truly suited and booted, there are numerous bars and restaurants that allow you to enjoy the era, but few do so as well as The Candlelight Club. A ‘pop up’ that doesn’t have a permanent home, it moves around London with events throughout the year that allow you to become fully immersed in the 1920s era – and that includes only being lit by very romantic and cosy candlelight. One of the most alluring qualities of London for many is being such a vast city, you can easily fade into a crowd. You can be anybody you want to be and enjoy the anonymity that you simply don’t get elsewhere. And if this is particularly appealing, holding your loved one by the hand, jumping on a Tube or into a taxi and heading to a random location can be such a liberating experience. Whether you decide to head to a part of Central London you’ve never been to before or explore the likes of Hampstead Village a little further out, you can find shops, try food and enjoy a tipple or two in places you simply won’t have come across by sticking to a strict schedule. It takes a little bit of an adventurous mind, but sometimes that’s what keeps a relationship as healthy as ever. Want to stay in London this Valentine’s Day? Explore our romantic offers for something truly special and memorable. Is spring the best time to visit London? How do you decide where to stay in London?